The musical abilities of Honor 9 were worked not only by the manufacturer's engineers: the audio component was made with the participation of the company Monster and the music producer Rainer Mallard, the winner of Grammy. Thanks to this, in Honor 9 there were at once two options for setting the sound for themselves: Huawei Histen and Honor Purity. How do they affect sound? 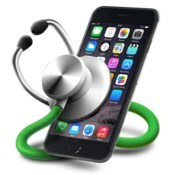 Can I use a smartphone with a serious headset? We tell. To fully appreciate the Honor 9, we'll take different headphones: from the full-size Audio-Technica ATH-MSR7 to the hybrid Dunu DN-2002. In the playlist, there was a place for the refined instrumental Jamie Cullum, and the modern rap from Machine Gun Kelly, and even the crazy metalcore Motionless in White. Huawei Histen - a technology that allows you to change the sound to your preferences. 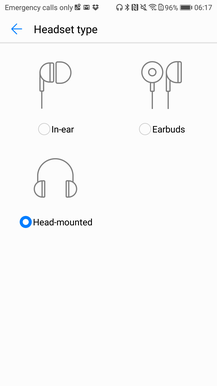 In it, you can choose the setting for different types of headsets. So, the preset for the in-channel headphones makes the pitch slightly V-shaped, adding volume. The mode for the inserts gives a more pronounced bass, which is often not enough for the devices of this form factor. And if you choose the setting for the overhead headphones, then the sound will get accent on the upper middle, putting forward the vocal. Note that these presets are configured for the "general case", so with different models of headphones the effect is different. For example, the intra-channel Etymotic ER4XR produces a neutral light sound, and the mode for inserts is best combined with them. In turn, the full-size Audio-Technica ATH-MSR7 have an emphasis on the upper mid, and in the mode for overhead headphones can tire out with excessive brightness. 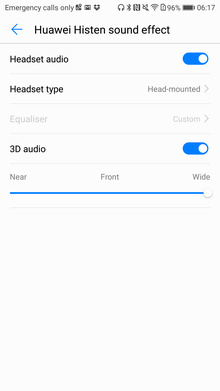 Huawei Histen also includes 3D audio effects, developed in conjunction with Rainer Mallard. There are three surround modes to choose from: Near for quiet music, Front for increasing bass and watching videos, and Wide for simulating the acoustics of a concert hall. Such effects are recreated with the help of echoes and dips in various areas of AFC: thus increasing the imaginary distance between the instruments and expanding the stereopanorama. It is worth considering that, in conjunction with headphones, which initially produce a surround sound, such a setting can greatly distort the sound. In addition to the listed options in Huawei Histen there is a 10-band equalizer Honor Purity for the most accurate sound settings. It allows you to adjust the sound with different headphones, hiding their shortcomings and highlighting the virtues. Already mentioned Etymotic ER4XR have hard and sharp high frequencies - to smooth them, it is enough to lower the range of 4-8 kHz. 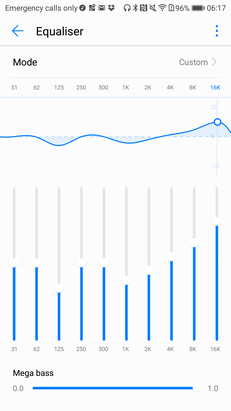 If you use with the Honor 9 hybrid headphones, such as the Dunu DN-2002, then it is worthwhile to raise the middle and make a decline in the region of 2 kHz. With a similar preset, headphones sound more balanced and do not cut a hearing on individual tracks. 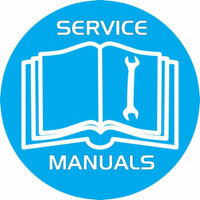 Honor also took care of those who do not want to waste time on fine-tuning the equalizer. For them, there are a lot of pre-installed presets, among which is "Clean Honor Sound". His work was developed by the company Monster, and it is especially interesting with him sound modern pop, electronics and rap: bass and voice in the compositions of these genres take on noticeable severity. By the way, a separate slider in the equalizer sets the number of low frequencies. Wide sound settings are never superfluous - everyone has different tastes and preferences in music. But even with the effects turned off, Honor 9 does not disappoint. The device produces a loud enough and clear sound, with a good elastic bass, detailed middle frequencies and low-key, accurate high frequencies. For most modern genres, its potential is sufficient. Honor 9 predictably behaves with sensitive hardware Audio-Technica ATH-IM02 and hybrids Dunu DN-2002, without straining distortions of the top and background noise. It is quite to the teeth more tight Etymotic ER4XR and full-size Audio-Technica ARH-MSR7. And the presence of an advanced equalizer makes the smartphone even more versatile, allowing you to smooth the nuances of the headsets and, most importantly, to find a preset with which your favorite music will sound best.